With integrated wireless connectivity, voice control, and home automation support, the black first-generation Sonos One isn't your typical wireless speaker. Equipped with Wi-Fi and a 6-microphone array, the Sonos One connects to your home's wireless network and allows you to intuitively play music, check the weather and traffic, hear sports scores, and more. Using far-field voice control technology powered by Alexa, the built-in microphones allow the Sonos One to pick up your voice from any direction in the room, even while music is playing. Note: Certain Alexa- and location-based features will have limited functionality outside the US. Please see the manufacturer's website for more information. Content acquired via certain apps may require subscription to a service. The Sonos One allows you to start and control your music with your voice with Amazon Alexa built in. Use your voice and the Sonos app to control and manage all your music in one place, including Amazon Music, Spotify, Pandora, Apple Music, radio, podcasts, and more. 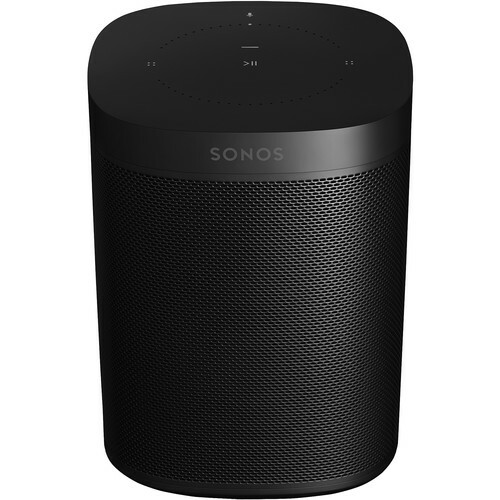 The Sonos One is designed to seamlessly sync voice, app, and touch commands, enabling you to manage music with a single word, tap of the app, or swipe of the speaker. Combine voice with the Sonos app to manage all your music in one place. The Sonos One wirelessly connects to other Sonos speakers in additional rooms, allowing you to expand your home sound system when you're ready. The matte all-black finish and metal grille are designed to fit into nearly any home. An illuminated LED indicator light lets you know when your speaker's microphone is active or turned off. The hard-wired LED connection helps ensure that nobody is listening when you want privacy. The 6-microphone array of the Sonos One is designed to hear you from anywhere in the room, no matter how loud the music is playing, thanks to smart voice capture and noise cancellation. Based on the design of the PLAY:1, the Sonos One is powered by a pair of Class-D amplifiers, which, along with the drivers, are tuned to the speaker's acoustic architecture. Tap to turn up the volume, swipe to skip a track, or mute the microphone for privacy. The Sonos One's controls are just a tap away. The compact 4.7 x 4.7" footprint of the Sonos One is well suited for bookshelves, counters, and other snug spaces. Designed to be moisture resistant, the Sonos One can stream your favorite songs in music-starved places like bathrooms and outdoor patios. All you need is Wi-Fi and a power source. Pair two Sonos Ones together in the same room for stereo sound, add a Sub for augmented bass, or pair with your display's Playbar or Playbase for home theater surround sound. The Sonos One wirelessly syncs with your entire Sonos Home Sound System. You can fill separate rooms with different songs, or group them together to hear the same song throughout the house. Box Dimensions (LxWxH) 10.0 x 6.9 x 6.8"
One (Black, Gen 1) is rated 4.4 out of 5 by 36. Rated 5 out of 5 by Eric from Love it for my style of usage! There are better sounding speakers out there, like the new Apple HomePod, but for my usage this is the best compromise between size, sound quality, ease of use, music options and price - perfect for mostly background music throughout my home. If I want better sound, no small speaker can compete with a larger, multi speaker system for serious listening, so that's what I have. I'm an Apple user, but the Homepod's cost and restrictive Apple access makes the decision easy. Way better sound than the Amazon Echos. Love the Alexa compatibility. One caveat: I wish you could control groups of Sonos speakers, which as of now you can't. Rated 5 out of 5 by RobLVT from Useful mobility Living in temporary quarters, this serves to provide very good sound without having to set up a more elaborate system. Just requiring a WiFi connection makes it very convenient and versatile. Rated 3 out of 5 by CT Sonos User from Nice Step Up From Play:1 I have 6 Sonos speakers throughout my house and the Sonos Connect linked to my primary A/V system. I'm a big fan of Sonos with one exception: Do not ever buy a Play:5. There is a constant audible hiss endemic to that speaker and Sonos is of no help in resolving the issue. As for the new Sonos One, it is nice to be able to control it via the Amazon Alexa function. However, at this time, it does not allow me to access my massive iTunes music library which is stored on my iMac server. I suppose that makes sense since Amazon wants users to subscribe to Amazon Music. Thus, for me, the Alexa voice function is limited to playing my Pandora stations, and even with that there is one major limitation. Any of the listed radio stations can be played, but Alexa will not allow "shuffling" of those stations. Also, the new Sonos One cannot be connected with a Play:1 to create a stereo pair. As a result of those listed drawbacks, though I regard Sonos highly, at least in the beta stage the new Sonos One rates just three stars. Rated 5 out of 5 by Christian from The Sound of Awesomeness The Good: beautiful, full sound that you will absolutely love! Whether its a local Hi-Res source or streaming from Spotify, they are a game changer. Plan to add the sub now that Im sold on the sound quality and investment. The Bad: not going to drop my rating for this, but the wifi setup on my 2.4Ghz was a gigantic hassle. Im typically on the 5Ghz network with my phone, iPad, MacBook and the Sonos app never seems to connect properly. Still working to figure out why they seem to vanish from the network, but it could be something with my router config. Rated 2 out of 5 by Tom from Just OK but not great I was hoping for a little better sound by creating a stereo pair. It is better than a single speaker but still not as good as I was hoping for. It does have microphones built in and is compatible with Alexa but if your trying to control lighting of any kind be ready to ask it over and over again to turn on or off a light. I connected all my Sonos one speakers via a hard wire CAT5 connection. There is a Sonos application available for Mac, Windows, Android, and IOS devices. It allows me to play music from my NAS music library. I cannot use Alexa to play music from anywhere except on line sources. Alexa will not play music from my NAS music library so I must have a computer in my hands to play my music from my library. I was hoping for voice control thru Alexa. Rated 5 out of 5 by Mike from Amazing speakers, Alexa is not as great as I was hoping The sound quality of the Sonos One is very impressive, as is it's integration with Spotify. ?While I was hoping for big things from Alexa, in reality I've been very surprised to find she's actually less competent than Apple's Siri; questions are often answered wrong and she frequently cannot find what I'm looking for on Spotify. ?Still, purely due to the sound quality and impressive app this is a strong buy, and with a software update that will add Google Home support in 2018 there is more functionality to come. Does it come with app to control it? Yes it does. Download the superb SONOS app from the Google Play store for Android devices or the Apple App store for iOS devices. is there an option to purchase with a UK plug? Is there any wall mount stands available for the new Sonos One? is there an option for a UK plug? No there is not. This is a USA only. This SONOS speaker will not behave like a bluetooth speaker for phone calls. Can the Sonos one play different music in different rooms like the play:1?